Spray 12-inch nonstick skillet with cooking spray; heat over medium-high heat. Place beef in skillet; sprinkle with 1 teaspoon seasoning mix from soup mix. (Discard remaining seasoning mix.) Cook beef 4 to 5 minutes, stirring occasionally, until brown. Stir in 1 tablespoon of the dressing. Break block of noodles from soup mix into small pieces. 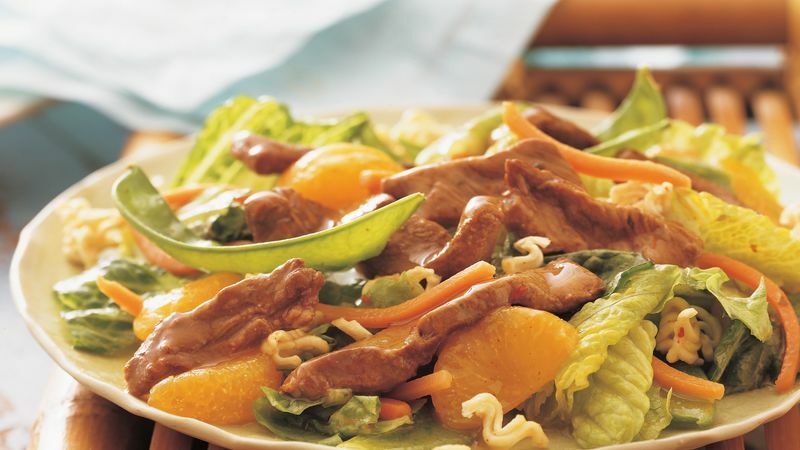 Mix noodles, lettuce, pea pods, carrots, and orange segments in large bowl. Add remaining dressing; toss until well coated. Divide mixture among individual serving plates. Top with beef strips. “This will impress your family and won’t add to their waistlines.” Wanda S.
What color is your diet? Even the colors of fruits and vegetables tell us that they are good for us, so choose colorful ones. Fruits and veggies contain antioxidants, which may help prevent cholesterol from damaging arteries by preventing LDL (bad) cholesterol from “sticking to” your arteries.